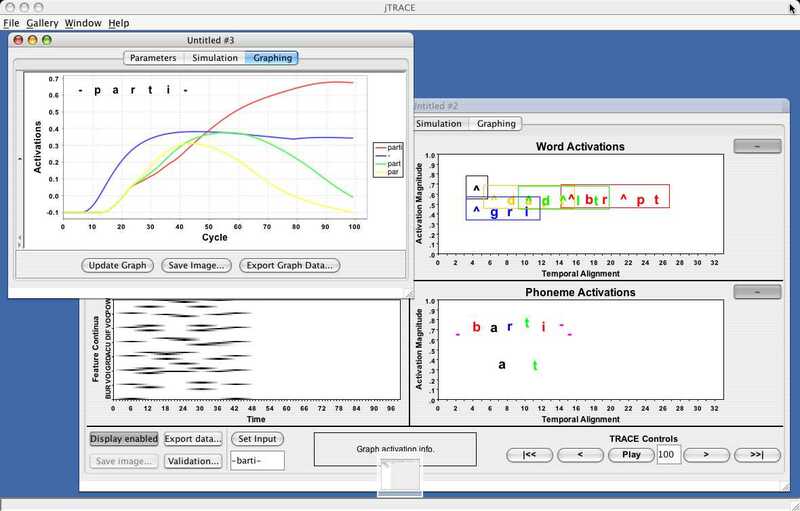 jTRACE is a freely-available re-implentation of the TRACE model of spoken word recognition. It is implemented in Java, and runs on any computer that supports Java. Researchers can run simulations quickly and easily, using code that has been validated against the original TRACE code. Advanced programmers can extend the jTRACE model to implement new behaviors. jTRACE was created by the Magnuson Lab at the University of Connecticut with the support of the National Institute of Deafness and Other Communications Disorders. TRACE is a highly influential model of speech perception and spoken word recognition, created by Jay McClelland and Jeff Elman (1986). The original implementation of that model was used to run dozens of simulations comparing TRACE’s behavior with results from experimental studies with human subjects. TRACE’s behavior accounted for human behavior in a number of important ways, and it is still frequently cited as the canonical interactive-activation model of speech perception and spoken word recognition. TRACE has proved remarkably robust, accounting for results in paradigms that were developed 10 years after the model (e.g., fine-grained time course measures from eye tracking). Underlying model is functionally equivalent to the original TRACE code. Graphical user interface is powerful and easy to use. Node activations are visualized as the simulation progresses. Graphical analyses of word and phoneme activations over time. Parameter and other files are saved in flexible XML format. ‘Duration scalar’ parameter for modifying the temporal extent of phonemes. Lexicon validation; sorting on lexicon table. The zip file below is for all operating systems. There is no installer. To get started, unzip the contents of the file into a new directory. On Windows run the “jtrace.bat” file. On Linux or Mac OS X, run the “jtrace.sh” file. (In Linux or OS X: open a terminal window, get to the new directory where you have unzipped jTRACE, and enter “./jtrace.sh” or “sh ./jtrace.sh”). See the Release Notes. NOTE: The following is a functional but not polished pre-release (beta) version of the software. Significant interface and usability bugs may remain. This appendix to the user’s manual distinguishes between the analysis options available in the graph panel. We’d like to know who is using jTRACE and what we can do to help (when we have time). Please send an email to Jim Magnuson to let him know you’re using the system. We’ll also keep you updated on improvements to the software. If you are interested in obtaining the jTRACE source code, please email ted.strauss@gmail.com. Strauss, T. J., Harris, H. D., & Magnuson, J. S. (2007). jTRACE : A reimplementation and extension of the TRACE model of speech perception and spoken word recognition. Behavior Research Methods, 39, 19-30. 8:30-12:00, July 26th, 2006: Speech Perception: Linking Computational Models and Human Data. Strauss, T.J., Mirman, D., & Magnuson, J.S.28th Annual Conference of the Cognitive Science Society. Vancouver, Canada. 2006. For assistance running jTRACE, or technical questions, contact Ted Strauss. For questions about psycholinguistic modeling with jTRACE, contact Jim Magnuson. For questions or problems with this web page, contact Jim Magnuson. There are three foundational papers on TRACE. Jay McClelland has made them all available on his publications page. McClelland, J. L., Rumelhart, D. E., and the PDP research group. (1986). Parallel distributed processing: Explorations in the microstructure of cognition. Volume II. Cambridge, MA: MIT Press. If you encounter a bug in jTRACE, please carefully document the problem and the circumstances under which it occurs. Please email bug reports to Jim Magnuson, with ‘jtrace bug’ in the subject line. Known bugs will be resolved in order of priority. If the help documentation does not open when told, navigate to the jTRACE/doc folder and open manual.html file in a web browser. Some edits made during scripting do not cause an update of the interface. In other words, after you change something, you don’t see the result of it. This problem usually affects adding and deletion of items. As a workaround, to see the results of these changes, it is necessary to save and reload the script file. I run the script, but nothing happens. Currently, jTRACE does not validate the contents of a script when it is run. Save and reload the script, double-check the logic of the script. If it still doesn’t work, let us know. jTRACE is coded in Java. The Java Web Services Developers Pack (JWSDP 1.5) is used. Two third party libraries are also included. Licenses governing their use are included in the THIRDPARTYLICENSES.txt file, included with the jTRACE download. Permission to use these tools has greatly enhanced jTRACE functionality. Permission to use, copy, and modify this software and its documentation for any purpose other than distribution-for-profit is hereby granted without fee, provided that the above copyright notice and this permission notice appear in all copies of the software and related documentation. Permission to distribute the software or modified or extended versions thereof on a not-for-profit basis is explicitly granted, under the above conditions. HOWEVER, THE RIGHT TO DISTRIBUTE THE SOFTWARE OR MODIFIED OR EXTENDED VERSIONS THEREOF FOR PROFIT IS *NOT* GRANTED EXCEPT BY PRIOR ARRANGEMENT AND WRITTEN CONSENT OF THE COPYRIGHT HOLDERS. IN NO EVENT SHALL THE UNIVERSITY OF CONNECTICUT BE LIABLE FOR ANY SPECIAL, INCIDENTAL, INDIRECT OR CONSEQUENTIAL DAMAGES OF ANY KIND, OR ANY DAMAGES WHATSOEVER RESULTING FROM LOSS OF USE, DATA OR PROFITS, WHETHER OR NOT ADVISED OF THE POSSIBILITY OF DAMAGE, AND ON ANY THEORY OF LIABILITY, ARISING OUT OF OR IN CONNECTION WITH THE USE OR PERFORMANCE OF THIS SOFTWARE.